The Epiphone Ltd. Ed .2014 Nighthawk Custom Quilt celebrates one of Epiphone’s most original and treasured designs with a beautiful custom AAA Quilt Maple Veneer Top. When the Nighthawk was first introduced in 1993, it was a truly modern guitar--a complete departure from "tradition" with its 25.5" scale length and its versatile combination of coil-splitting humbucker and single coil pickups. Break-through designs don't always catch on right away. Such was the case with many now-iconic guitars including the Flying-V, the Explorer and even the Les Paul. But original Nighthawk fans knew it was a supremely versatile axe that made it possible for one player to sound like a dozen different guitars at the flip of a switch. And today, a new generation is discovering the Ltd Ed 2014 Nighthawk Custom Quilt and its powerful pickup combination and beautiful finish. The Epiphone Ltd. Ed. 2014 Nighthawk Custom Quilt is essentially a combination of an SG (with a lower bout and thinner body) and a Les Paul (upper bout). And just like those classics, the new Ltd. Ed. 2014 Nighthawk Custom Quilt features a solid Mahogany body (with added "belly" scarf for comfort) and an exquisite AAA Quilt Maple Veneer top. The hand-glued Mahogany neck has a SlimTaper™ D-shape profile and the original Nighthawk’s famous 25 1/2" scale for a well rounded, warm tone with excellent sustain. The headstock is back-angled at 14 degrees, which increases pressure on the strings and helps them stay firmly in nut slots for stable intonation and tuning. A Dozen Guitars in One! The Epiphone Ltd. Ed. 2014 Nighthawk Custom Quilt allows players the ability to cover all the classic sounds of rock, pop, jazz, and country in one guitar. The Nighthawk features a unique pickup combo that includes a full-size NHT™ humbucker (bridge), a NSX™ single-coil (middle) and a NHR™ mini-humbucker (neck). 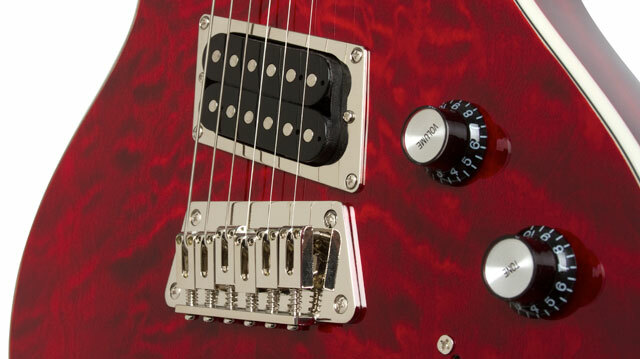 When combined with the 5-way slider and push/pull coil-splitting tone knob, the 2014 Nighthawk Custom Quilt offers you 9 different "tones" at your fingertips--from a powerful and warm humbucker to the unique clarity of a mini-HB to a thin, bright single-coil--and everything in-between. 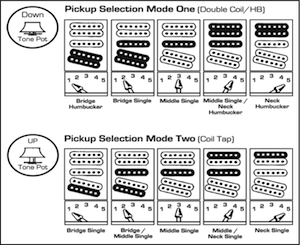 The Alnico II pickups are double-wax-potted to avoid microphonics at high volume and can be dialed-in with a single volume control. 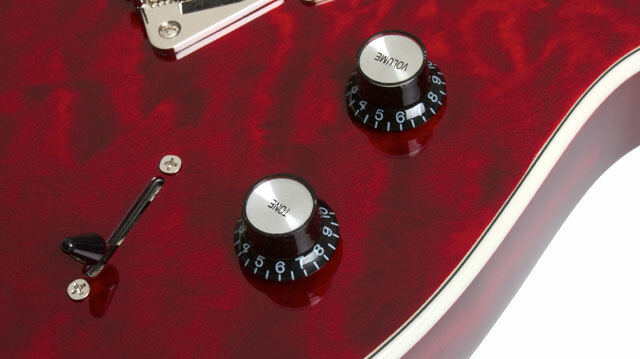 The master tone control features a push-pull switch to split the coils of the bridge pickup, allowing for quick and unique tone changes. And don't forget, the Nighthawk’s nickel bridge with its "string-thru" body design ensures maximize resonance and sustain. 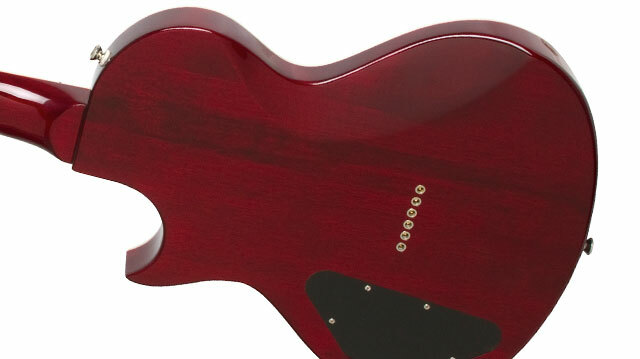 The bridge also features individual saddles for independent height and intonation adjustment. One of the first things you notice about the Ltd. Ed. 2014 Nighthawk Custom Quilt is the gorgeous, AAA Quilt Maple Veneer top and the pearloid "crown" inlays on the fingerboard. The Epiphone Ltd. Ed. 2014 Nighthawk Custom Quilt is available in your choice of Translucent Black, Translucent Purple, Translucent Blue, and Translucent Red. And, the 2014 Nighthawk comes with premium 18:1 ratio Grover™ machine heads for excellent tuning accuracy and stability while Epiphone's heavy-duty output jack and long-lasting 1" potentiometers make for worry-free operation.